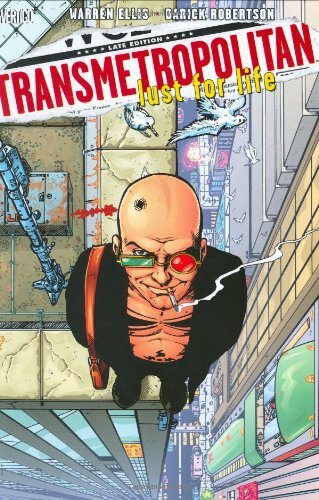 I recently finished browsing, reading and re-reading Warren Ellis’ Transmetropolitan trades Lonely City and Gouge Away. I already have Spider’s Thrash on order and it should arrive any day now. Yes, I am little behind the times but I don’t normally read comics and am too lazy to buy each release as it comes out. I am a reader of books, but Transmetropolitan is so good that it could easily make me a reader of comics. Having read the series as well as Scott McCloud’s Understanding Comics, I am much more open to the graphic novel than ever before. The stories in Transmetropolitan eerily mirror present day news, such as part one of “Dirge”, published in April 2001, which features a sniper picking off people in the print district of the city in which the series take place. That story bore an uncanny likeness to the recent sniper shootings in the Washington D.C. area. Not all stories contribute to the plot, but help to set the mood for the world which Spider inhabits. One such story is the award-winning “Another Cold Morning” which tells of a woman cryogenically frozen in our time and revived in Spider’s time, only to be unwanted and shocked by the new world around her. The shock which the woman experiences is much like the shock and nausea we feel when reading Transmetropolitan’s first few stories as we are thrust into Spider’s world, similar but so very different from our own. It is impossible to summarise the stories, plots, feel, and philosophy of Transmetropolitan. This comic really needs to be read. Patrick Stewart reads it, you should too. Addendum: Regarding the Foucault comparison, check out this interview with Warren Ellis which has a question towards the end about Foucault and Spider. Update: Vic pointed me to this picture of Hunter S. Thompson in his younger days. Why do these people all look the same? John Ralston Saul, what a guy!